Create Pretty Blog: My tips for buying on Amazon! My tips for buying on Amazon! A fairly recent Instagram to Facebook post raised a lot of questions from my friends. I posted a picture of my husband meeting the UPS guy in the road, to get TOILET paper. I'll be honest- I was a little worried we were going to run out... which seriously, I wouldn't have let us run out. I am fully capable of running to the store and grabbing toilet paper. But I also knew that I had saved pretty significantly (which you'll see several examples in this post) when I subscribed to receive toilet paper delivered directly to my door. There were some people that seriously questioned my sanity at whether having toilet paper delivered was actually worth it. Well would I do it if it wasn't worth it? ;) Here is exactly what I spent on that particular order (and I had to cut the screen like this to protect our address- but I promise I am comparing apples to apples with Quilted Northern). The top picture is my Amazon invoice and the bottom is directly from the Target website. So let me turn the question on you... was it worth it? And P.S.- my family was never without toilet paper. I am way too busy to spend my life in a store. I much prefer to shop online. I do love to go shopping and it does help me clear my head and be inspired- but not buying groceries and wrangling children. That's not fun and that's not inspiring. I LOVED couponing. It was therapy for me. But I will be completely honest- I have entered a new stage of life that my time (and sanity) is just worth more than the savings of clipping coupons. I also wanted to find a way to still get great deals, but have them delivered to my door. In 2 days. I already shared my secrets of using BOXED to buy snacks, food, and household type items here. What I love about Boxed is that this is more like Sam's and Costco items- so think BIG and bulk. They have no yearly fee, and any order over $50 is shipped free. Which is super simple to do! Use the code Z42FG to save you $10 off your first order! 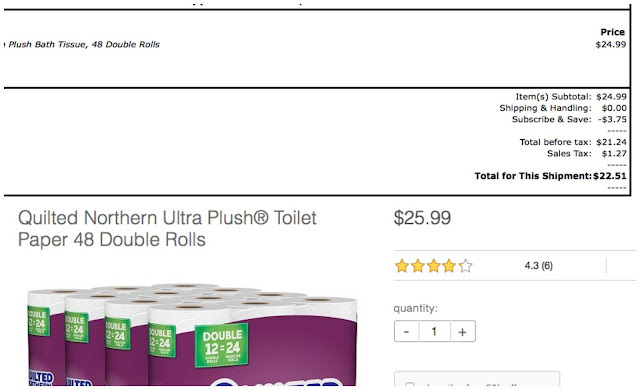 See how I don't really have any other options besides just adding it to my cart? So this is the best way to purchase this particular item on Amazon. I add it to my cart and it's at my door in 2 days. When you do Amazon a few times you learn what the best way is. To get the BEST price, I clipped the 25% coupon, then clicked "review subscription" and this screen pops up. THIS will be the price you pay, NOT the $11.46 from the original screen. ALWAYS look for items with a coupon! Because why not? Savings on top of savings is only going to save you more! Notice the total goes from $11.46 to $8.58. Both prices include the 15% off for S&S (more on that in a minute), plus the 25% off coupon. Then they add tax. But that simple little coupon sure did save a lot! And for a quick Walmart comparison of the same product. YOU GUYS we aren't talking about a few cents in savings. That's OVER FIVE DOLLARS and fifty cents saved! AND YOU AREN'T LEAVING YOUR HOUSE! Sorry for the keyboard shouting. But that's flippin' exciting! The BEST part about S&S is that you can collect these deals ALL MONTH LONG. So I will see a deal, I'll subscribe and it will LOCK IN the price that day! I would say the ONLY drawback to S&S is that you have to wait until a predetermined day for everything to ship. For instance my ship date is the 30th or 31st of every month. So the last day I can change my S&S order is the 24th. But from the 1st-the 23rd I can tweak it however I'd like. If you decide you don't like an item you added earlier in the month, you can unsubscribe with no penalty. Also if you find it for a better price you can add the better price to your S&S and delete the higher priced item! I collect items all month, subscribe to each of them and then go through around the 20th and finalize my order. In order to receive the 15% S&S discount, you MUST have 5 items in your S&S order. 4 items or less and you'll receive 5% off. That 15% off is before coupons, so any savings you can add will help your total go down. I love S&S and I regret not utilizing it sooner. A few times I have had to forego the S&S discount because we just needed an item sooner, which is fine, but you don't get the 15% off. Just the regular Amazon price. Another unsolicited tip that I have learned is that S&S will charge your credit card INDIVIDUALLY for each item. It's just how it works so double, triple and quadruple check that you are using the correct card on file. I read a horror story of a guy who used the wrong card and overdrew his account, BUT his bank charged him for.every.transaction. So he had like 10 items in S&S and was charged the $30 penalty 10 times. YIKES. So be careful! That's about everything you need to know for Amazon Subscribe and Save! 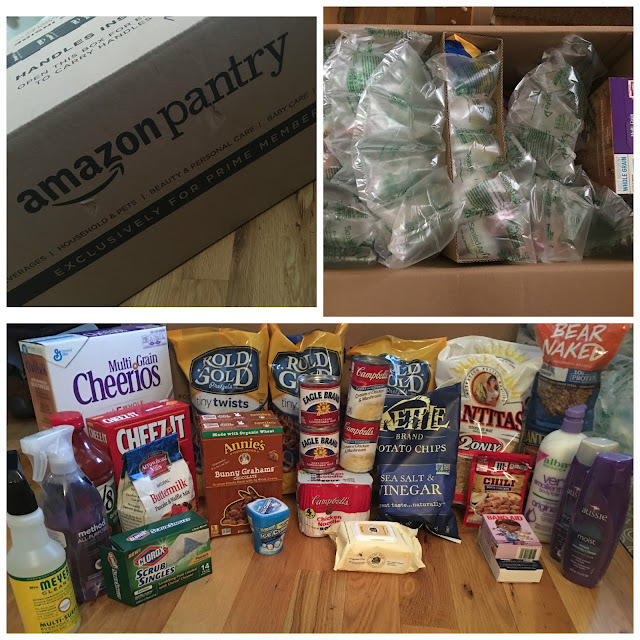 The gist of Prime Pantry is that Amazon gives you a box- each item you add to the box takes up a certain % of space and weight. Each item you click on will tell you what that percent is. Once your box is 100% filled you pay $5.99 to ship it. Except I've never paid $5.99 to ship! Because, hello I'm CHEAP. 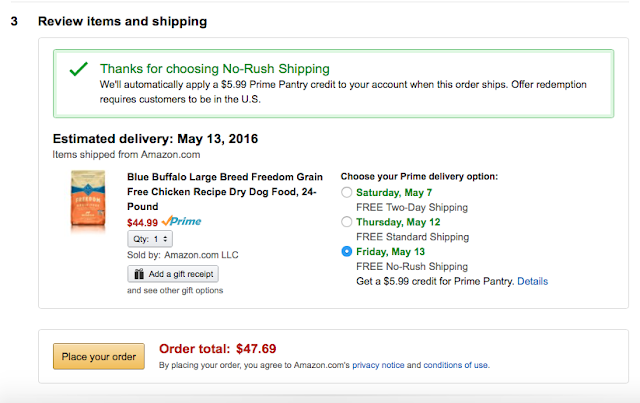 They will occasionally offer free shipping on larger items you purchase through regular Amazon. Pay attention to the different ways to ship before confirming your original order. 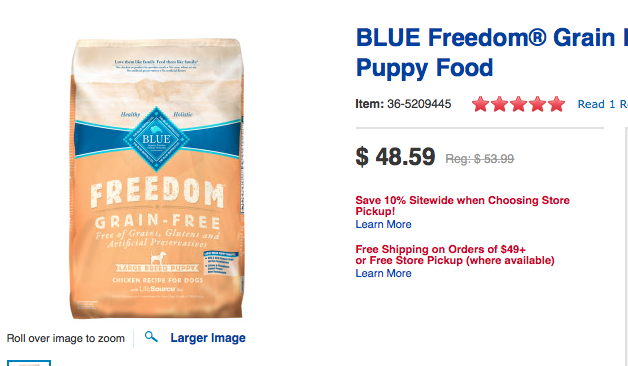 For instance, Ella's dog food used to be on S&S. We'll it was taken off, for whatever reason. So now we just buy it like normal. BUT the last time I purchased it, they offered a $5.99 discount on my next pantry box if I waited 4-5 days for my order! Of COURSE! Because that's $5.99! So I applied the discount to my Prime Pantry box, which made shipping free. I have found that while S&S will typically blow store prices out of the water (especially when combined with coupons), Amazon Pantry is more like the grocery store prices (not on sale). But I can shop at 11pm when the house is quiet and IT'S DELIVERED TO MY DOOR! They say that it can take up to 5 days to deliver but my orders have never taken more than 2 days. Also I've found that you can fit ALOT in your box. Most items fill between 1%-8%. Here is an example with some Aussie Shampoo. And my apologies for people who have something against the word "moist". In this example you see the price ($4.59). This is great because there is a $1 off coupon if you simply click that green box. NO PAPER COUPONS! One click will literally save you $1! Then you can see that a few lines under the green box it says that it fills 4.8% of my box. 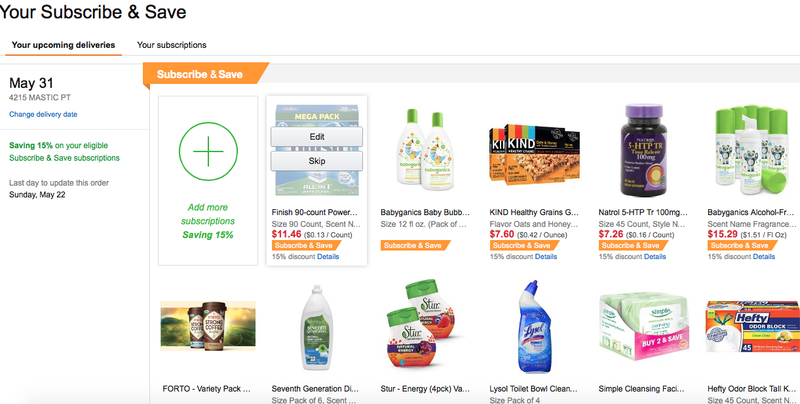 Prime Pantry will keep up with your total at the top right of your screen while you shop. So easy. The good Lord knows I love me some Target. But $3.59 compared to $5.49 is kind of a big deal. So you're saying that I can save $1.90 MORE without leaving my house and having it delivered? Yes please! 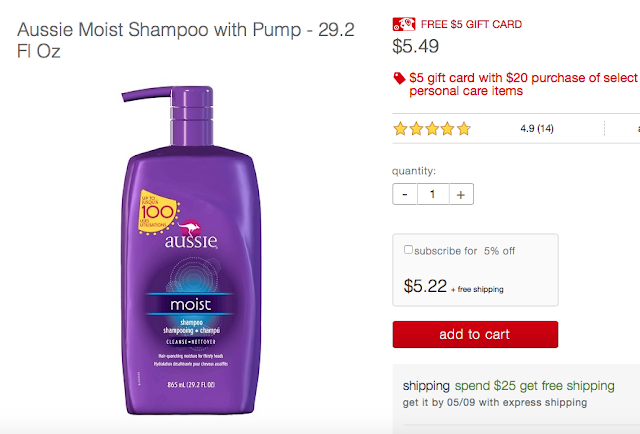 Target was offering a $5 gift card for spending $20 on Aussie products, but honestly my goal is not to stockup, but to get things the cheapest I can each month. Bigger things like paper towels or cat litter will obviously take up more space. But mix that up with bandaids, shampoo, and chicken broth and you are good to go! My box typically contains 20-40 items depending on the size! And seriously TRY THE CHICKEN BROTH. It's not pictured here but I buy 2-3 on every order. So go here, click shop now on the blue screen, and DOZENS of items will pull up. We aren't huge on processed food and snacks, but organic cleaning products and shampoo and conditioner? Yep! Be sure to use the promo code PANTRYMAY to receive the $5.99 credit! Voila! That's another simple way to get free shipping! I always add the 5 items first to be sure I get the discount. Then I fill the rest of my box. And I always go DIRECTLY to the "coupon" tab next! Then the deals tab, and then to the regular priced items! It usually takes me about 30 minutes to fill my box and I always price compare back to S&S (sometimes cleaning supplies are cheaper back there) and Boxed. Once I determine where the best price is I will go from there! It would take me MINIMUM an hour to shop at the store, and then I still worry if I am getting the best price! Of course I'll still run across a great deal in the store every once in a while, but again for my own time and sanity, I much prefer to order from the comfort of my couch. I've never had an item spill, and my orders have always been accurate (except they left out a bandaid box once but a simple message to customer service credited the amount to my account). Amazon has other services that are amazing, but this is post is DEFINITELY long enough. Amazon Mom is GREAT for those of you buying diapers and formula. Kindle Unlimited is awesome if you are an avid reader. I hope that this long boring post taught you that Amazon is so much more than just a place to grab things 1-2 times a month. You PAY for this service so use it! Google promo codes. Search lightening deals. Follow Amazon Deal facebook pages. People put a lot of work into this so utilize it best for your family! And did you hear that? Do what's best FOR YOU! For me, I enjoy shopping at night from the quiet of my couch. Also I am less tempted to grab a throw pillow or throw some other item in my cart since I'm not stepping foot inside a store! Plus no meltdowns past the toy aisle or candy aisle! Win! *This post has affiliate links. Anytime an item is purchased from my affiliate link I get a small commission from the sale. This helps both of us because you are getting a great deal and I am getting pennies on the dollar. Read my disclosures here. I am tossing the idea around at having a fairly regular post with my current favorite Amazon products that I am either buying, or would buy if I needed it. I'd love to hear feedback whether this is something you'd like! Either way I'll get a deal, but I'd love to pass the savings to you. What are your thoughts?